Mt. Abram is located in Greenwood, Maine just outside of Bethel and in the shadow of its bigger, but not necessarily better neighbor Sunday River. Mt. Abram offers 44 trails with a 'boundary to boundary' ski policy which makes my kids extremely happy. Mt. Abram is typically open Thursday - Sunday and holiday weekdays. Parking is right beside the main lodge and is a level walk. Its easy to drop your gear at the door and go park. There is also a West side lodge that services the beginner terrain but you will need to start your day at the Main lodge if you need rental services. They have a neat tractor pull wagon to shuttle skiers to and from the two lodges. Over the summer of 2011, Mt. Abram had a freak lightening strike and an unfortunate fire that destroyed their main lodge. They constructed a steel building to serve as a base lodge and it does the trick. Not glamorous but functional. Over the summer of 2014 they installed a boatload of solar panels which is awesome too. I give a grade of a A- for parking access and a B- for the day lodge. For a mid-size hill, Mt. Abram has a great variety of trials. A lot of the trials are named after the cartoon Rocky and Bullwinkle so the trail names are a lot of fun. I have never felt crowded on Mt. Abrams trails. Once you get past the unload area of the main double-lift, you have a lot of choices to spread people out. The main area is serviced by a double chair and the T-Bar is fired up when it gets busy. I have never waited more than 5 minutes in a line and I have visited on busy days. The beginner west-side area is also serviced by a double which adequately moves folks up the mountain. The lifts are not the newest on the block, but the lifts are sheltered by trees so wind-holds are rarely a problem. I give a grade of an A- for trail crowding and a B for lift infrastructure. Beginners are serviced by their own section of the mountain called the West Side. It is a great place to learn to ski as it is separated from the faster, advanced skiers and there are a variety of trails to choose from. There is a carpet lift for the really new skiers. A beginner terrain park is offered on the west side to for new park skiers. Outside of Saddleback, this is the best place in the state of Maine for beginner terrain. I give a grade of a A to the beginner terrain. Mt. Abram has some really fun blue cruiser runs. A bomb down Boris Badenov center mountain is a great way to start the day. Dudley Do-Right and the not so often skied Round-A-Bout offer great fun and high speed groomer skiing. The terrain park features seems to move around the mountain from year to year. Not huge hits but good for my kids. I don't think Mt. Abram is known for its Terrain parks however. I give a grade of a C to the terrain parks. For a mid-sized mountain, Mt. Abram has some really good expert Terrain. Fairy Tales is the trail under the lift and its one of the best lift line runs I have ever skied. Fearless leader is a great groomer bomber and they leave the sides un-groomed for some great bump skiing. 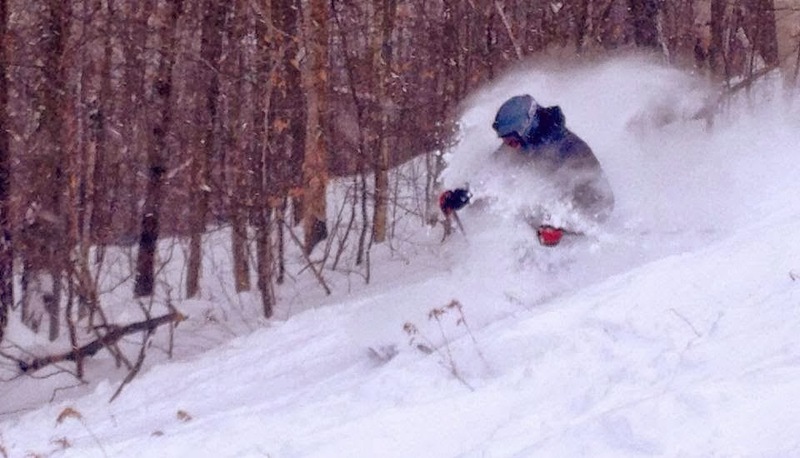 Rocky's run is one of the steeper pitches in Maine and left in an un-groomed state. The runs are not super-long but offer high quality skiing. I give a grade of an A- to the expert terrain. With a boundary to boundary policy, you can basically ski anywhere. I hear there are some great off-map glades on the mountain. The on-map glades are so-so. They are cut funny and don't have a natural feel to them. But the boundary to boundary make my boys happy as they can find their own glades. I give a grade of an B- to the gladed terrain. Check the resort website for the latest pricing but it is generally a good value. Mt. Abram sells tickets through Liftopia which offers some money savings. Overall, the full-price ticket is one of the better values in Maine. I give a grade of an A- for day-trip lift ticket pricing. .
We have had some really good days at Mt. Abram. We wonder why people drive by this gem of a mountain to go to Sunday River. It is well worth the visit. When the snow is on at Mt. Abram, you can spend all day and have an awesome time. It reminds me a lot of Saddleback. It is pure Maine skiing... the way skiing should be. Your family will have a lot of fun at Mt. Abram! Overall - I give Mt. Abram a ranking of a A-. For the family, it has an edge over Black Mountain of Maine, but I can't put it on the same level as Saddleback or Sugarloaf. Regardless of what I think, you should check out Mt. Abram! Look for more ski mountain reviews in upcoming posts. Feel free to comment on what you think about Mt. Abram below. Mt. Abram is a gem. A grade of B++ in my book is an 'A' any time, especially at Mt. Abram. It's hardly a hill; it is a hidden mountain to explore and enjoy with the family both young and old. It's one of life's treasures. Thanks for posting! Maine High School Class C states are at Mt. Abram February break so we are looking forward to it!